The Rolling Stones begin their new contract with Universal Music Group with the release of their album Exile on Main Street in a Deluxe Edition with bonus tracks. The of these unearthed songs, “Plundered My Soul” is at radio and on YouTube via a fan’s video after the jump. The album will include 7 or 8 outtakes, but wouldn’t you like to hear a bit of the conversation in the studio too? Let it Be Naked’s “Fly on the Wall” cd is an idea that should be repeated more often. I haven’t read much about this track but I think it has been “refurbished,” or augmented by current performances. It’s not a great Stones song but I support ALL Deluxe Editions/reissues and especially Universal Music Enterprises, who generally do very high quality work. With a cover by Robert Frank and recording session photos by the late Jim Marshall, you can assume there will be excellent, previously unseen images in this package. Starting in the 90s with Marvin Gaye, UMe’s Deluxe Editions have set the industry standard for repackaging, and that’s why the Stones are with the label. 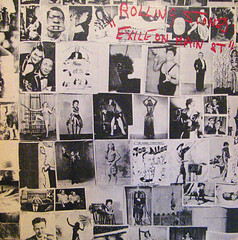 The bottom line is that Exile on Main Street is one of the best albums ever, and even if this were a documentary about the album created by the band it would be a relevant artifact. There are so many stories associated with it, we can reduce them to tags: Gram, Nellcote, Marseilles, etc. We have a lot to look forward to! “Plundered My Soul” – does it fit or not? Does this sound like a song from 1971? How many more do they have stashed? A few other reissues will come out on Universal, or already have, but outtakes and b sides could easily keep the Stones rolling for another decade easily. I hope they are holed up with Don Was trying to make new songs that could also fit in on this album (or any of their pre-Steel Wheels lps). To buy a copy of the UMe Deluxe Edition, please click here. “Plundered My Soul” video premiere on Yahoo! Music; it is “the first video from the band in years” (they didn’t make videos for “A Bigger Bang” but maybe embarrassed themselves on “Bridges to Babylon”). “Plundered My Soul” is available on iTunes on April 20. “Rip This Joint” is set to be featured in the NBA Playoffs airing on ABC & ESPN beginning with the Cleveland vs. Chicago game on Saturday April 17th. The May 2nd episode of “Cold Case” will feature several Rolling Stones tracks, including the new track “So Divine (Aladdin Story)” from the Exile Deluxe Edition. 2 CD deluxe edition audio content, plus gatefold 2-LP 180-gram vinyl, a 30-minute documentary DVD with footage from Cocksucker Blues, Ladies and Gentlemen…The Rolling Stones and Stones in Exile, and a 92-page case-bound collector’s book with rare photos from the Exile era. Original 18-track release and 10 special bonus tracks. Original 18-track album on two 180-gram heavyweight audiophile vinyl LPs in gatefold sleeve. Remaster of the original 18-track release.